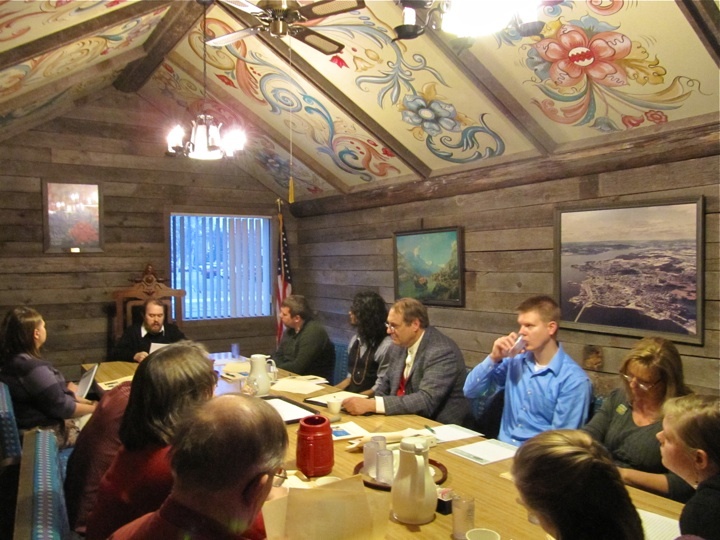 On December 13, 2011, Dr. Tom Isern (North Dakota State University) held his annual senior seminar presentations for his students (seminarians) at the Kringen Lodge in downtown Fargo, North Dakota. This is a chance for seminarians to get on-the-job training in a formal setting where they fold about four months of theoretical ideas and practice into a research paper to be delivered before an audience of their peers, colleagues, family and friends. 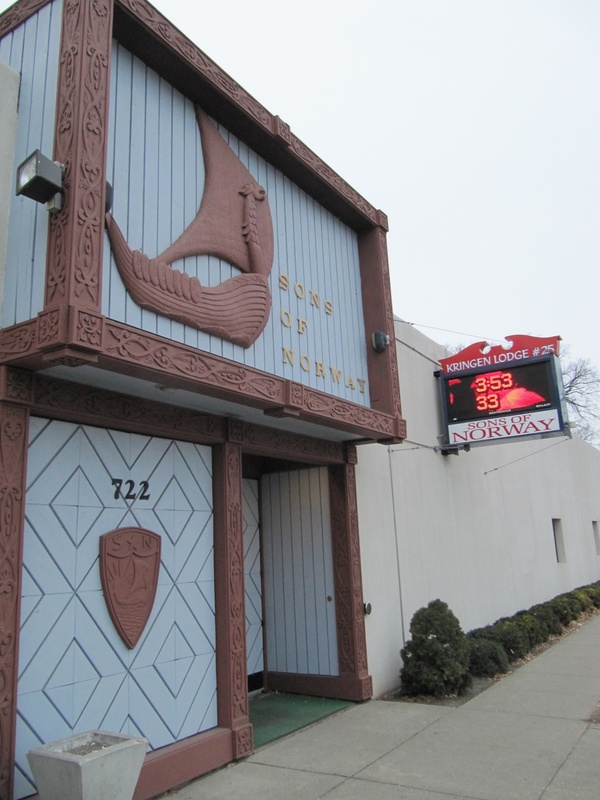 North entrance to the Sons of Norway Kringen Lodge #25 in downtown Fargo, North Dakota. Because historians are extremely interested in how societal perceptions and values change over time, Isern directs his seminarians to focus on otherwise forgotten monuments on the northern Plains. The seminarians, in turn, select a monument and start assembling the historical processes that contributed to its construction. The seminarians scrape below the surface of it all, and through oral history and archival research they begin tracking how the monument’s memory group either 1) held on to notions of the monument’s original intent; 2) shifted the way in which they perceived the monument; or 3) became atomized or fractured over time, and through this dispersion lost a segment of group consciousness all together. This latter case is perhaps one of the most important, since it means a segment of historical culture was lost (perhaps to be recovered). Culture might be thought of in the form of its root word cult, which came from the Latin word cultus, this originally meaning “adoration” or “to care.” (this is also connected to the word agriculture). The research project also allows the historian to provide the connective tissue that links the bits and pieces of memory about a particular monument together. The story by which a monument came about can then be revived, and this story can be received and accepted, critiqued or refuted by the public. This is why the methodologies used to craft the histories are scrutinized throughout the research and writing processes. Much in the way that an artisan requires training to learn how to shape a blunt sword between hammer and anvil (and grind and sharpen its edge with whetstone and leather), a historian and a history does not become sharp unless it receives intellectual scrutiny and critique. Dr. Tom Isern and his seminarians deliver and critique research papers at the Kringen Lodge in Fargo, North Dakota. This also means the processes of research need transparency, since the historian’s business is to demystify the past. Epistemology is another name within the larger game. Through this demystification the past is made accessible, or at least brought out of the archives and democratized for a broader public. Theoretical models about monuments and memory have near universal points of departure. The directions collective memory takes, however, remains unique, and this is where the Center for Heritage Renewal‘s public history archive allows for increased dissemination throughout the digital world. Click here to be directed to the database of completed projects within Isern’s senior seminar. This entry was posted on Friday, December 16th, 2011 at 12:49 pm	and posted in Uncategorized. You can follow any responses to this entry through the RSS 2.0 feed.